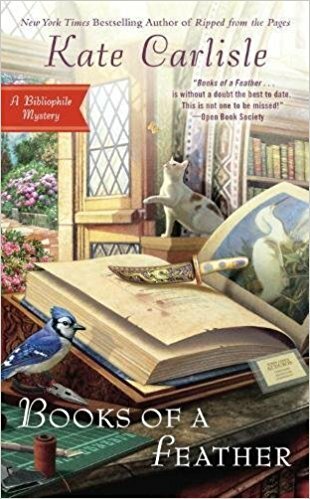 In this novel in the New York Times bestselling Bibliophile Mystery series, San Francisco book-restoration expert Brooklyn Wainwright’s latest project is for the birds, but it may have her running for her life. . . .
Brooklyn’s friend runs the Covington Library, which is hosting an exhibit featuring John James Audubon’s massive masterpiece, Birds of America. During the gala celebrating the book, she is approached by Jared Mulrooney, the president of the Bay Area Birdwatchers Society, to repair a lesser known book of Audubon drawings. Read more about Kate and her mysteries at www.KateCarlisle.com! As a birdwatcher, I would love to read this mystery. I love Kate Carlisle’s books. Even before you turn the first page, you find a story in the cover. Thank you for hosting this book on your blog. Thank you, robeader. I agree, the covers are *SO* much fun! In the Secret Room at KateCarlisle.com, I’ve shared free 12 Changes covers for each of the Bibliophile Mysteries. (Can you find 12 changes in the cover?) They’re really fun, and some of the changes will make you laugh.